Our staff, along with generous help from local residents, past alumni, and archivist Braxton Hicks, have compiled the following presentation entitled "Then and Now". It features photographs of Jefferson as we knew it yesterday, compared alongside more current views of the same parts of town. Whenever possible, we attempted to match the positions and angles of the pictures as closely as possible. This project is ongoing, and future additions will undoubtedly be added. Contributions and comments are welcome. Enjoy. 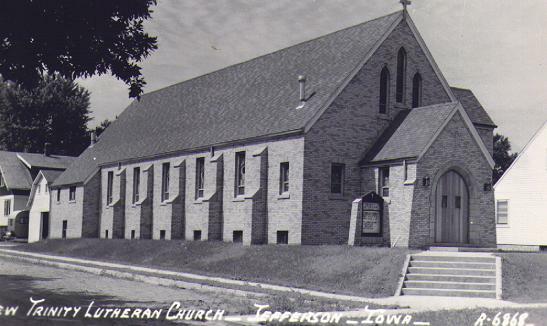 The Presbyterian Church in Jefferson is located at 208 West State Street. The photo at left was taken in the early 70's just as workers were preparing to dismantle it. Note the upper story stained glass windows have been removed. At right, the current Presbyterian Church is shown from the same perspective. Note the bank is now in place to the east. 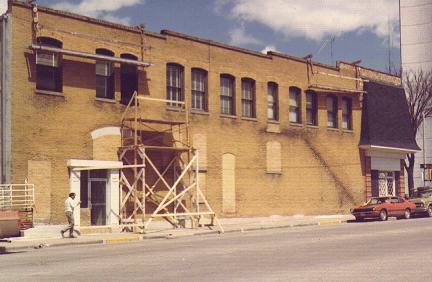 The south side of Woodruff's Pharmacy downtown (later Drugtown, then Hy-Vee Drug) was remodeled in 1975. The photo at left was taken during remodeling, at which time the street was also torn out and replaced, as is evident in the photo at right. 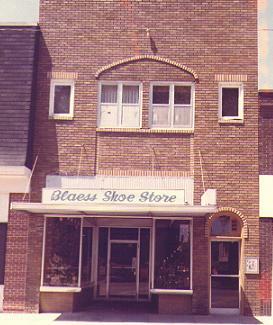 Blaess Shoe Store was located at 104 North Wilson on the west side of the square in the old Home State Bank building. It is pictured at left. 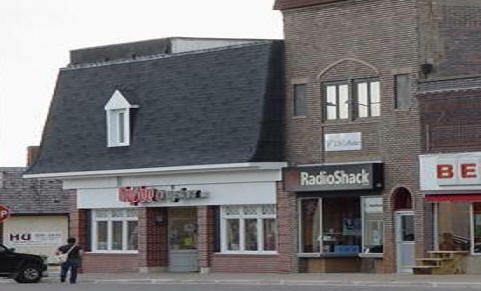 Today that is the site of Radio Shack, pictured at right. 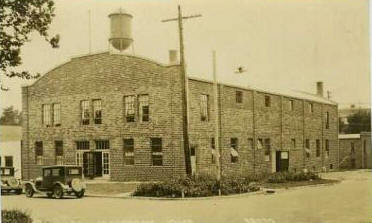 The photo at left shows the old Jefferson armory as it looked in the 20's and 30's. 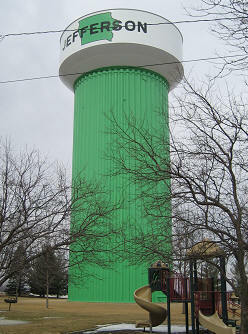 Jefferson's water tower is prominent in the background. 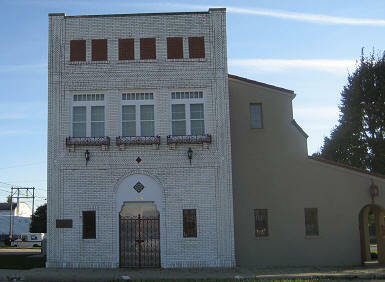 The photo on the right shows the building as it looks today - home of the Elk's Club lodge. 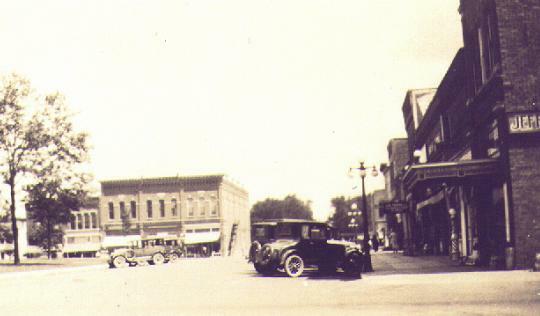 The south side of the square around 1920 was photographed on the left. You can easily spot the Head (later Lincoln) Hotel. The small structure on the very right may be a popcorn stand. 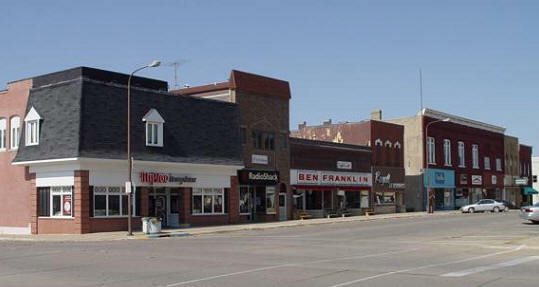 To the right is the same area as it appears today. 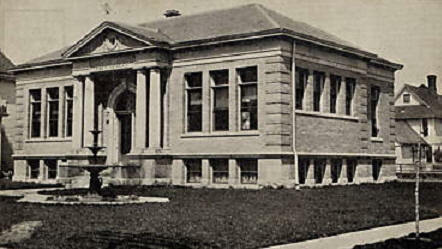 The old photo of the Jefferson Public Library on the left features a fountain in the front. The houses to the north and west were later removed. 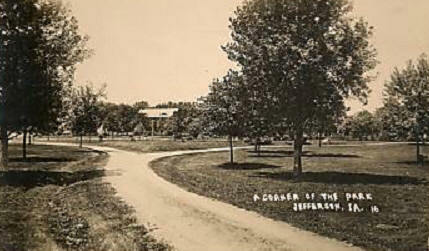 In the current photo on the right, you can see the library addition at the far left. The southern portion of the east side of the square. At left, as it appeared in 1975. Notice Saba's Bakery and Coast to Coast. On the right, from a slightly different angle, the same area as it appears today. 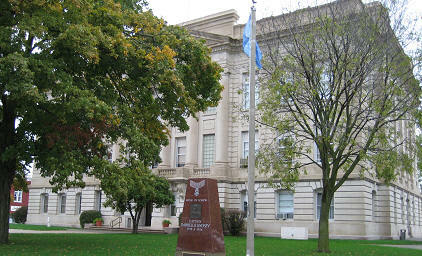 South side of the square facing west. The photo at left was taken shortly after the turn of the century, circa 1910. Notice the wires strung overhead diagonally across the intersection. On the right is the area as it looks now. Virtually no traffic in either photo. Hotel Head, later the Lincoln Hotel was located on the south side of the square. 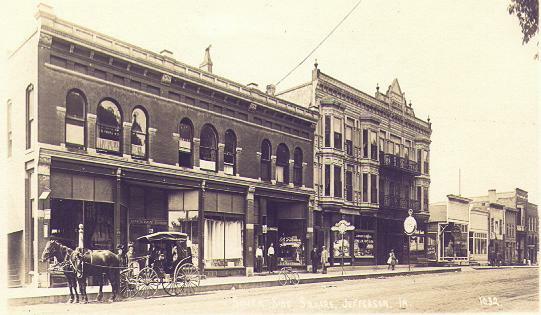 The photo at left, circa 1920, features balconies, and a clock out front on the sidewalk. 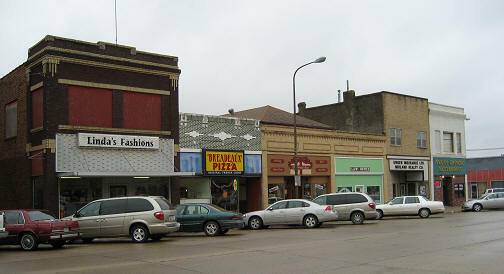 On the right, a photo of Lincoln Square as it appears today. 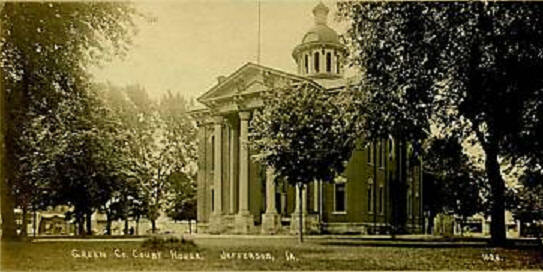 The Greene County courthouse shown on the left was torn down in order to make room for the present courthouse in 1917. 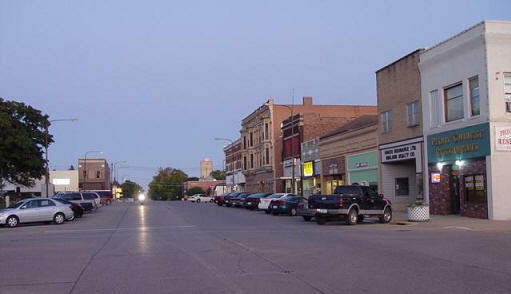 Lincolnway looking east across the south side of the square. The picture on the left was probably taken around WWII. Gordon's Cafe can be seen along the south side of the street. Today's view is on the right. 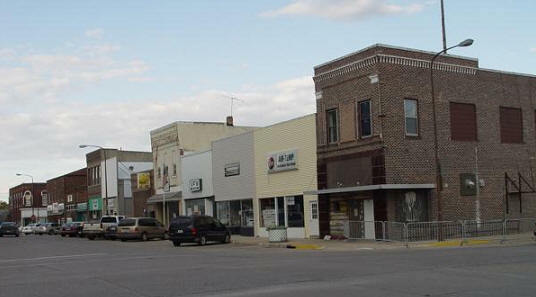 The west side of the square in downtown Jefferson. On the left, a shot taken around 1910. Note all the storefront awnings. To the right, from a slightly different angle, is the same area today. 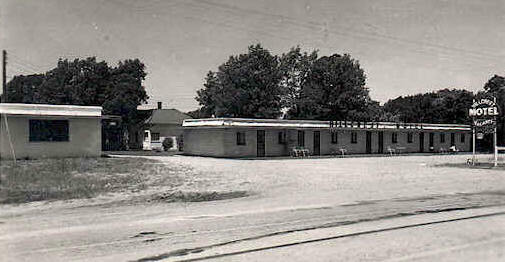 The old Hillcrest Motel is located west of town on old Highway 30. The picture at left was taken in the late 50's, when they were open for business. What is left of it is shown on the right. The sign and lettering on the facade have long since disappeared. 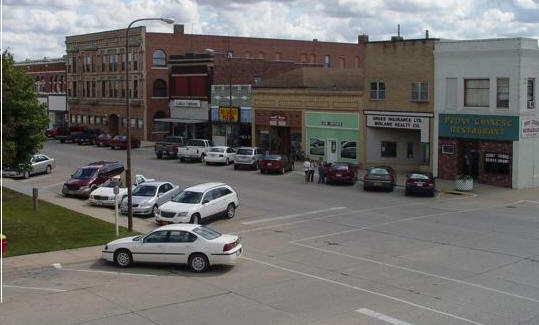 This is the north half of the east side of the square as it appeared in 1975 and, again, in 2009. 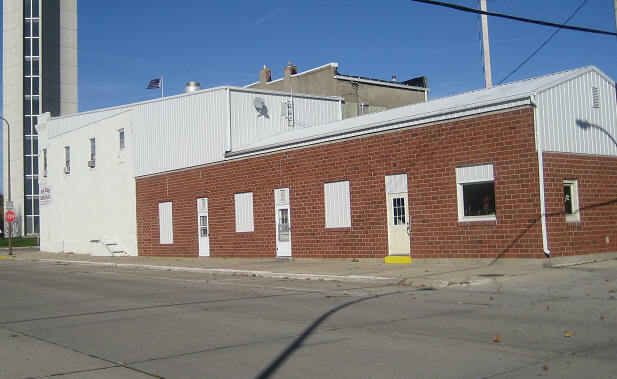 The angles are slightly different, as the old Baller hardware building appears farther away in the more current photograph. 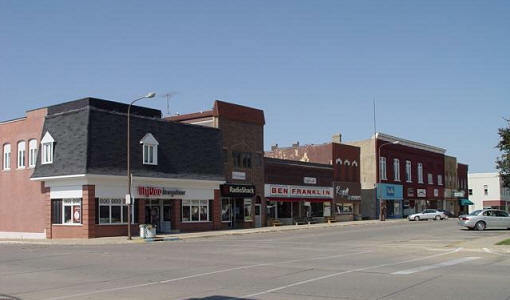 The west half of the south side of the square as it appeared in 1975 versus 2007. 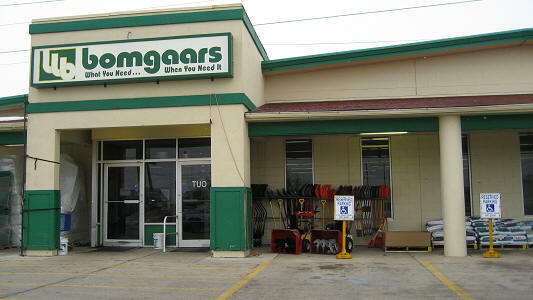 All stores have changed hands. 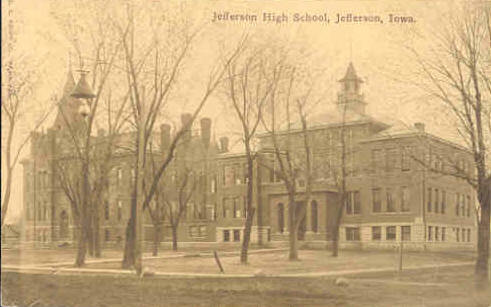 Jefferson's original public high school, later the north grade school, was located at 400 North Wilson. After many changes and renovations, it was eventually torn down. Today it is an empty lot, encompassing an entire city block. The east end of the south side of the square, from slightly different angles. 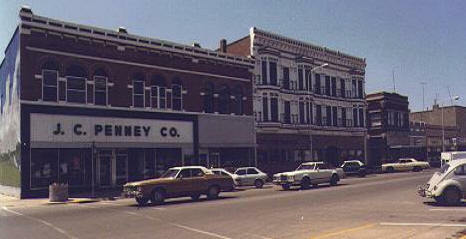 The first shot was taken in 1975, and featured J.C. Penney and Tucker Pharmacy. The recent photo at right shows the newly renovated Lincoln Square. 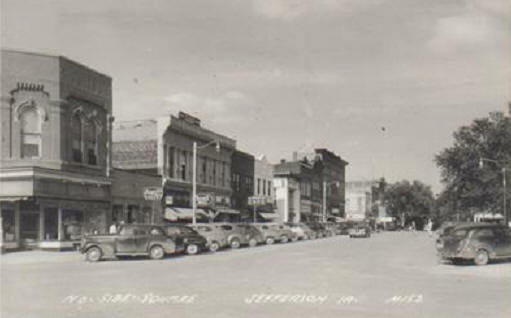 The north side of Jefferson's square taken from two different angles probably over 50 years apart. The prominent building at the left was the old Cigar Store; now the tea room. The photo on the left was taken in 1975 and shows the west end of the north side of the square at that time. 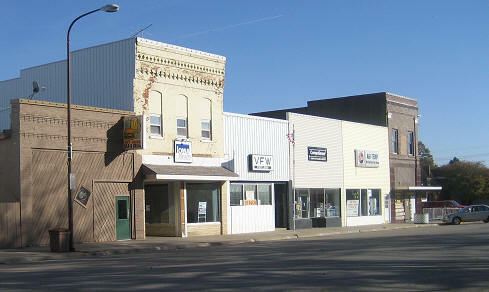 The photo at right , taken recently, shows that all of the businesses have changed hands. Durlam and Durlam Clothing and KDLS were still present in '75. Brenton Bank can be seen on the extreme right. 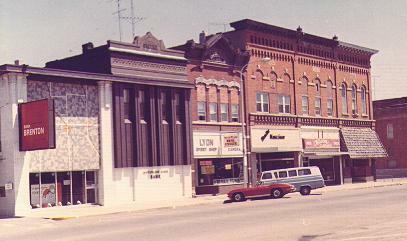 The photo on the left was taken sometime in the 70's, and shows the 100 block of South Wilson just off the square. It is noteworthy in that the popcorn stand can still be seen, and stop lights are visible on the corner. The water tower is still visible in the background. The shot taken at right, while not an exact match, was taken recently and shows a close-up view of the same area. 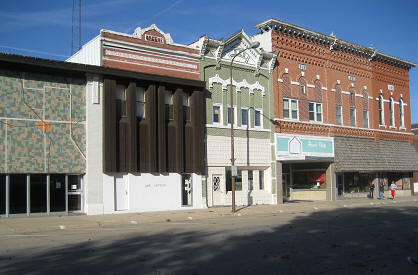 These are two views of the Columbian Block building on the west side of the square. The photo on the left was taken in 1975, looking north. The next photo, taken in 2008, is also facing north. 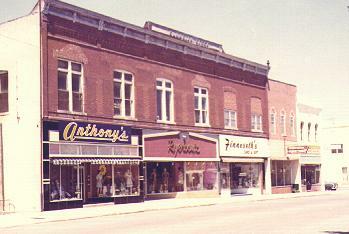 In 1975, the stores were: Anthony's, Ryerson's, Finneseth's, Figenshaw Furniture, and Seela Hardware. 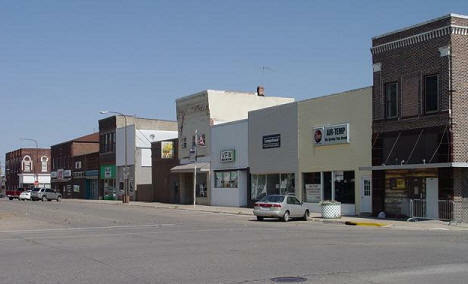 Changes on the west side of the square between 1975 and present. 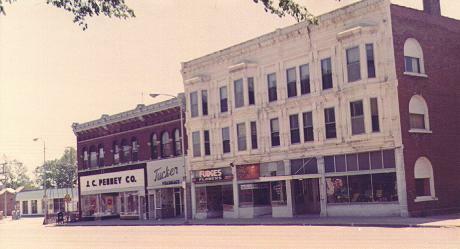 In '75: Woodruff's Pharmacy, Blaess Shoes, Places, and Royal Jewelers. 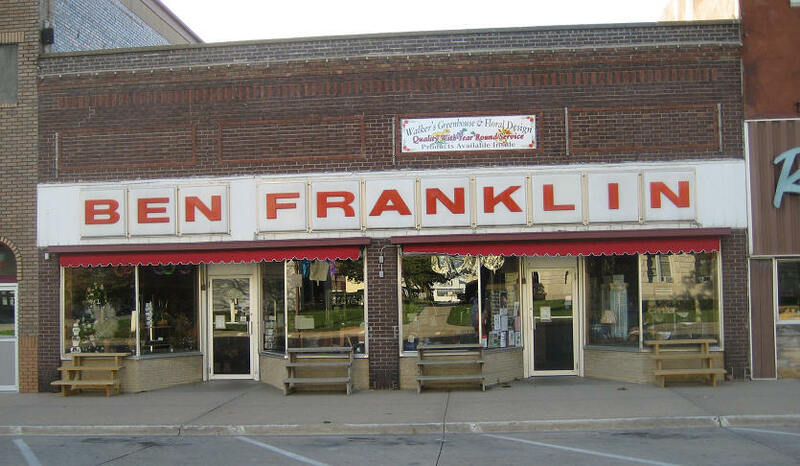 Today: Hy-Vee Drug, Radio Shack, Ben Franklin, and Royal Jewelers. 1905 on the left, 2005 on the right. We're on the sidewalk facing east along the south side of the square. In the photo at left, you can make out the Rosse Cafe sign. Note also the old street lamp. Do you remember the drinking fountain on the sidewalk? 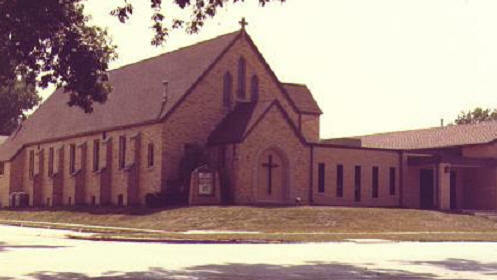 The Trinity Lutheran Church on West Lincolnway. At left, as it appeared shortly after its construction in 1952. 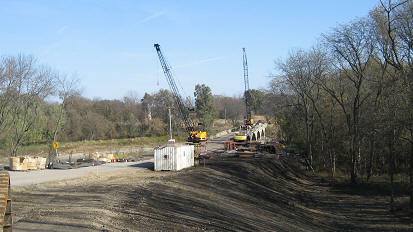 On the right, a current photo showing the additions added later. Once again, we're on the south side of the square. 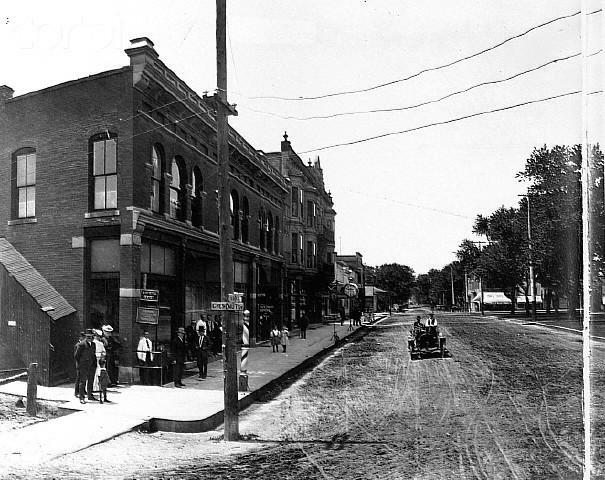 The left hand photo was taken around 1910, showing an unpaved street and a horse and buggy. On the right, the same place sometime in the 1980's. J.C. Penney's is still there, and the Lincoln Square Building replaces the Head Hotel. On the north side of the square, just east of the old KDLS building. 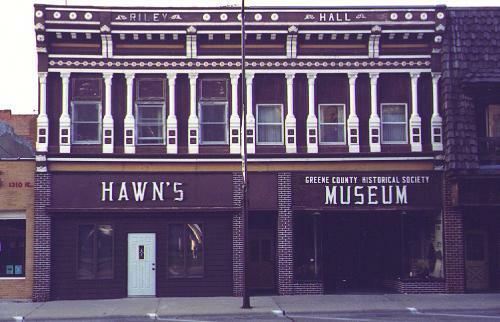 In 1975 (left), Hawn's Accounting and the Historical Museum. Today (right), Cool Beans and Junck. 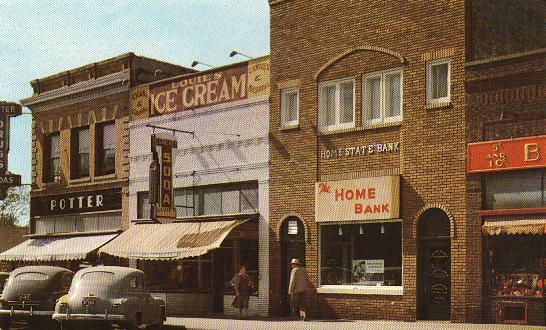 In 1956, the south end of the west side of the square was home to Potter Drug Store, Louie's Ice Cream Parlor, and the Home State Bank. Today, after several occupants in between, Hy-Vee Drug Store and Radio Shack reside there. 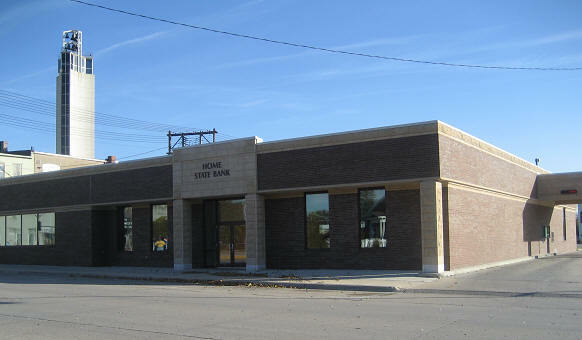 The Home State Bank moved to its current location at 115 West State Street in 1962. The left photo was taken at that time. The recent photo on the right shows the bank as it currently looks, from a slightly different angle. The east side of the square looking north. The photo at left was shot in the fifties. You can see the Peacock Lounge in the foreground, with a Buick dealership next door. 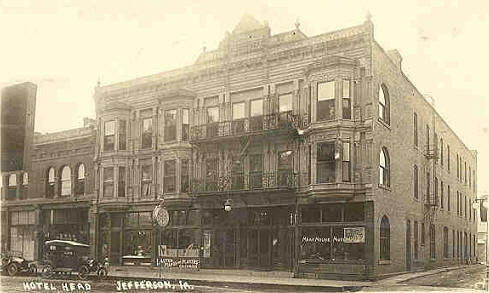 Note the large arrow atop the lounge directing people to the Jefferson Hotel - the same person owned both establishments. Today (right), the lounge has been condemned. The west side of the square looking south. The first photo was probably taken around 1900. In the current photo on the right, the Mahanay Tower is just visible on the extreme left edge. 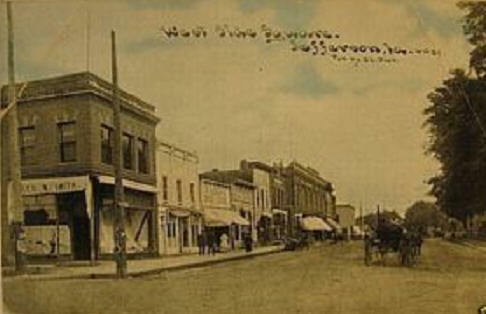 In 1900, notice how the town appears to end a couple of blocks south of the square. 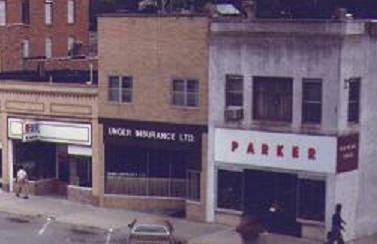 The left-hand photo of downtown Jefferson, while not the best quality, clearly shows Parker Shoes, Unger Insurance, and the Lunch Box Cafe on the south side of the square. 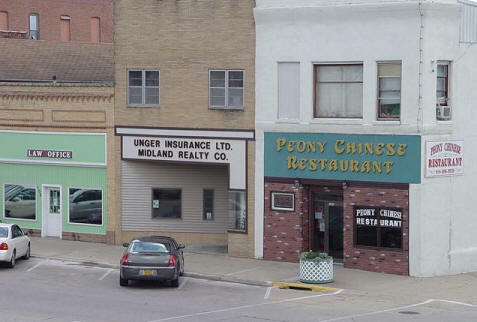 Today, we see the Peony Chinese Restaurant, Unger Insurance, and law offices. 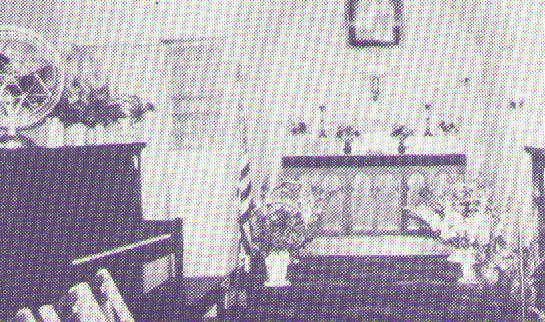 On the left is an old, low-quality photo showing the interior of the Trinity Lutheran Church when it was located at 306 South Maple in Jefferson. 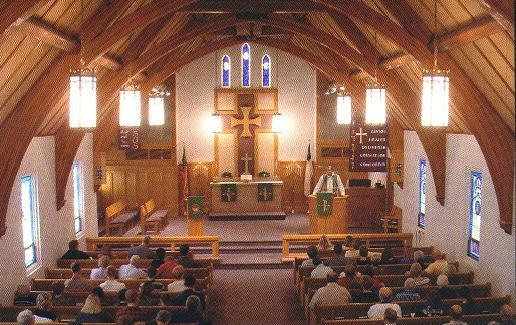 On the right, a recent photo taken of the interior of the current Trinity Lutheran Church, located at 801 West Lincolnway. The A and W Root Beer Stand was a fixture on East Lincolnway in Jefferson for many years. 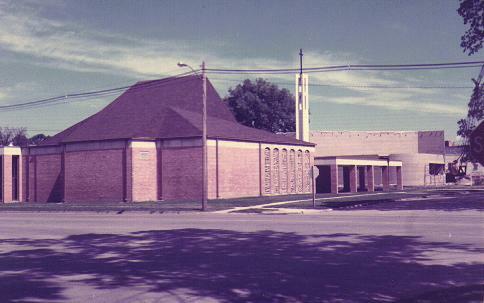 It is shown at left as it looked in the 1960's, looking east. Forty years later, as shown on the right, it no longer exists - even the logo has been removed from the sign. The second photo was taken facing west. 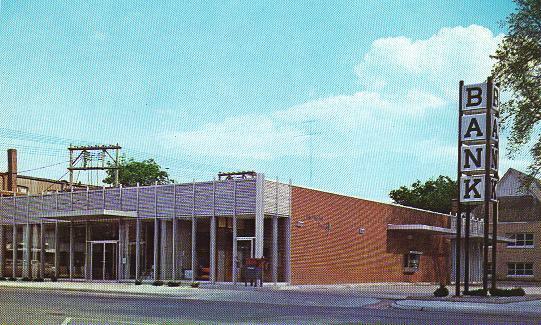 On the left, Jim's Super Valu as it appeared in around 1974. 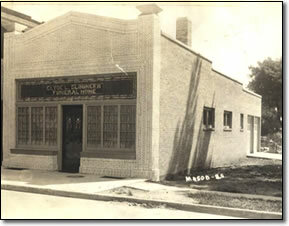 It was located on the corner of Elm and McKinley. Today (right), the same location is home to Bomgaars. Some aspects of the original structure can still be seen. 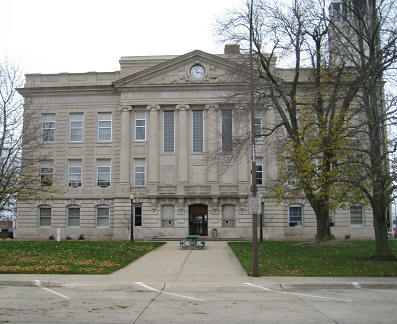 A view of the Greene County courthouse, this time looking at the north side. The old courthouse at left was photographed around 1900. It was removed in 1917 in order to make way for the new structure, shot in 2008 (right). 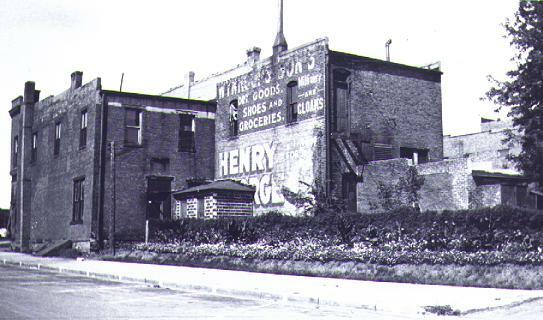 The photo on the left is a very old shot of Finch Shoe Repair, when it was located at 112 North Wilson. This picture was probably taken in the 1890's. 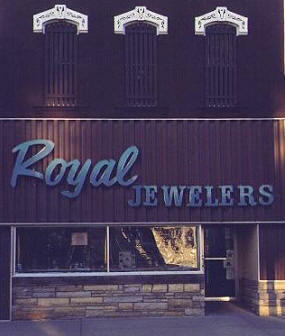 Today, Royal Jewelers occupies that spot. 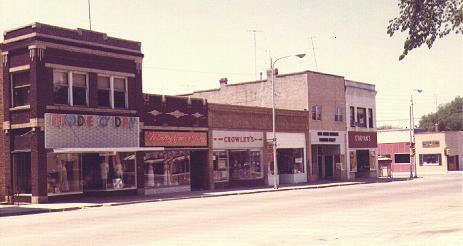 Royals is shown at right as it appeared in the mid-1970's. 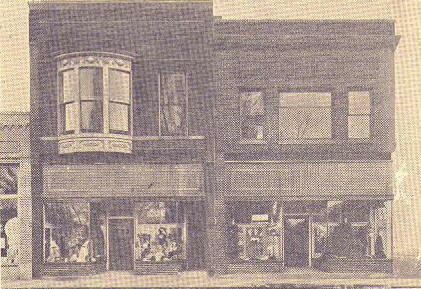 The Oppenheimer Clothing Company as it first appeared at 112 East State Street in the 1800's. Later it became Oppenheimer Durlam, then Durlam and Durlam. The photograph at right was taken nearly 100 years later, when the building was home to The Establishment. 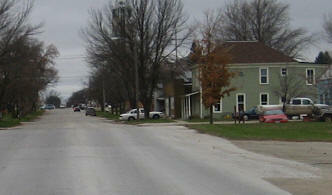 The original public school located at 400 North Wilson in Jefferson is shown on the left. This building later burned down, and was replaced with the structure we are more familiar with. 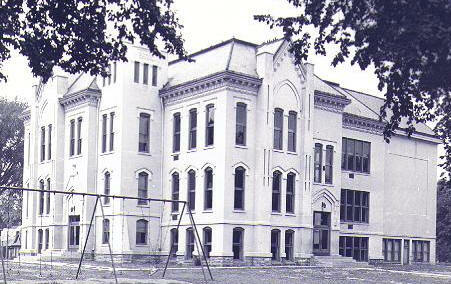 The North Grade School was photographed on the right when it was briefly painted a cream color. 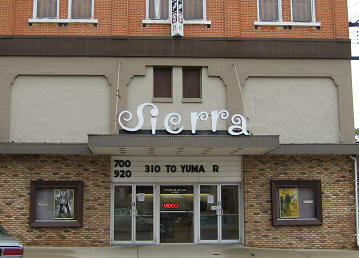 The Sierra Theater is located at 212 East State Street. Before that, it was known as the Iowa Theater. 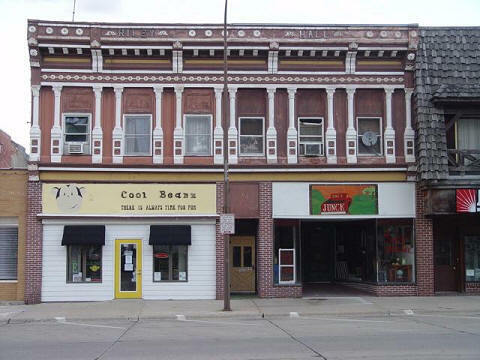 The picture at left shows the final days of the Iowa Theater, as it was in the process of being remodeled under the new name. 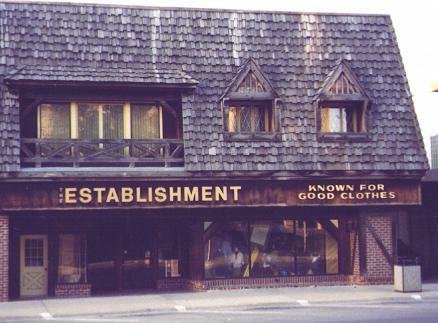 The old Home Furniture Company was located at 212 North Wilson where the arcade later stood. It was photographed on the left in the 1940's. 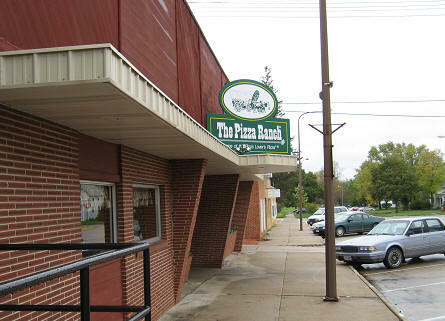 Much later, after several tenants, it became home to the Pizza Ranch, seen on the right. An interesting photo. Both shots face roughly SSE looking down North Wilson toward the site of the present Mahanay Tower. The shot on the left was taken in 1917, showing men preparing to go off to the war (WWI). The old bandstand is prominent in the front. Interestingly enough, behind it you can see both courthouses! The old one had been moved west toward the street, so the new one could be built. You can just make it out on the extreme left. The old structure was subsequently torn down. Jefferson's original water tower, which I'm sure no one now remembers, as it looked in the 1800's. Today's familiar structure, built in the 1970's, is on the right. On the left is the old Bordenaro Market as it appeared for much of its existence. 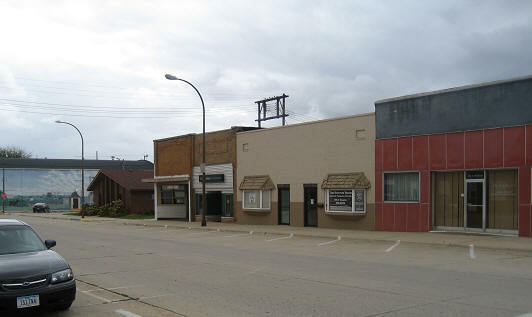 It was later an auto parts store, and now (as seen on the right) sits empty. The corner of Lincolnway and Vine in the 1950's, stoplights, awnings, and all. You can easily see Potter Drug on the corner and Louie's next door. That is the Home State Bank just beyond. 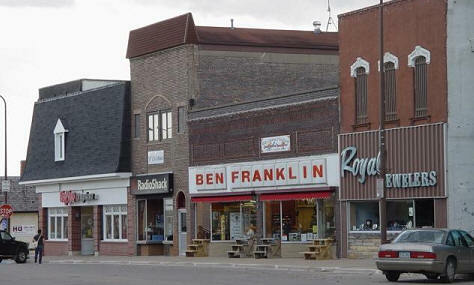 On the right, the corner as it appears today with Hy Vee Drug, Radio Shack, and Ben Franklin's. 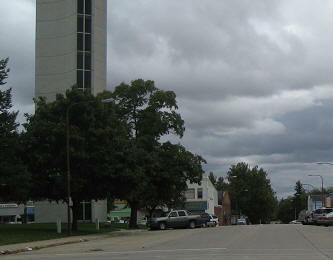 East Lincolnway looking toward downtown. The first photo was probably taken in the 1950's. A Texaco sign is in the foreground, and the old Mason Hotel is directly behind it. Today's view is on the right. The old hotel has undergone some remodeling. 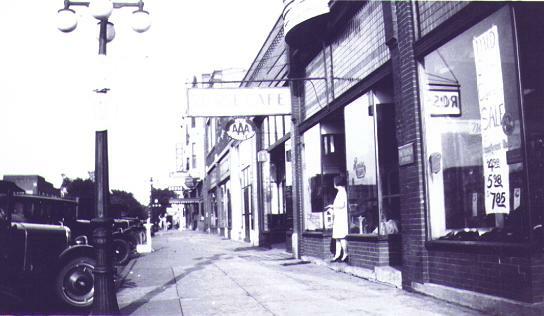 The Western Auto Associate Store was located at 111 North Chestnut, along the east side of the square. 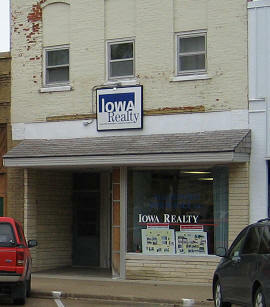 Today that is the home of Iowa Realty. 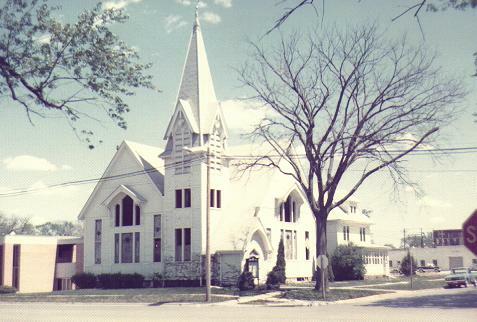 The Central Christian Church, located at 108 North Elm, in Jefferson - as it appeared fifty years ago, and as it looks today. 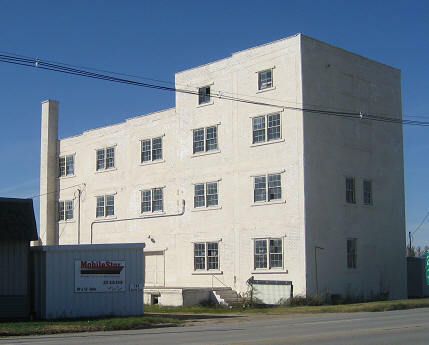 The Howard-Iowa Products factory was located at the corner of Elm and McKinley. Later it was used by the American Athletic Equipment Company. 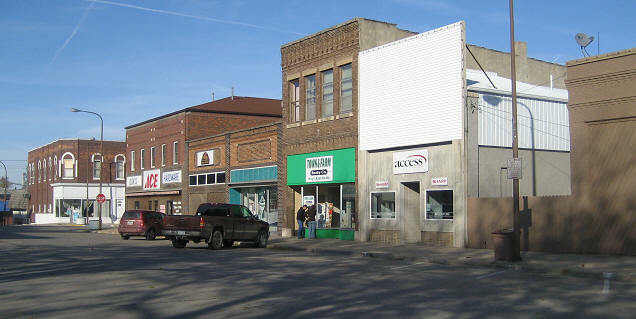 On the right is the building as it appears today. American Athletic Equipment Co. as it appeared in 1970, and again, as it looks today. 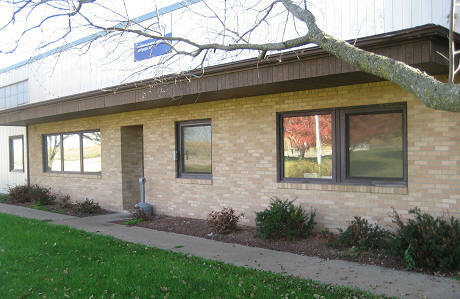 It is located at 200 American Avenue in Jefferson. 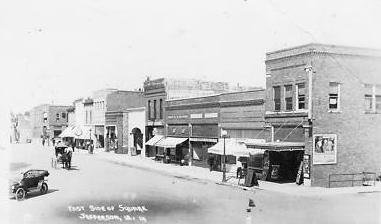 A view of the south side of the square in Jefferson as it appeared in 1925 is shown on the left. On the right, today's view. The Dairy Lunch has been replaced with Breadeaux Pizza. 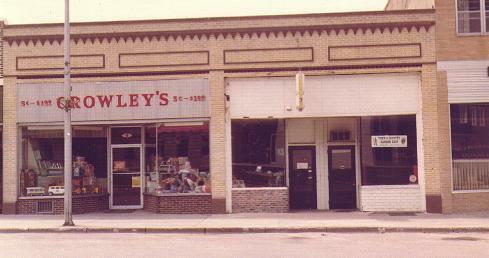 106 North Wilson in Jefferson was the home of Gately's 5 and 10 Cent Store. Later it changed hands and was Ben Franklin's. Still later on it was the home of Place's Department Store. Today, on the right, it is once again Ben Franklin's. Saba's Bakery was a fixture for generations at 109 North Chestnut, on the east side of the square. The photo at left shows cakes and pastries in the window of his shop. 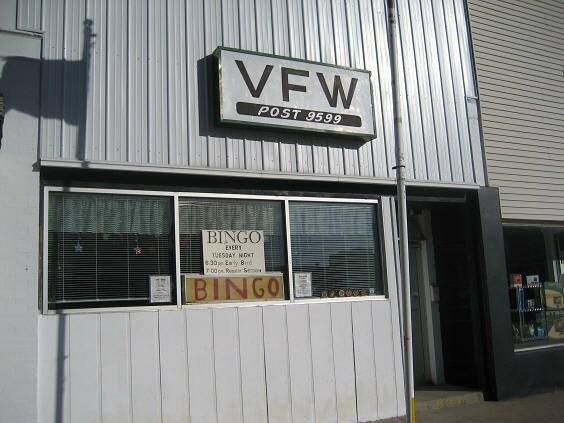 Today, that site is the home of the VFW, pictured at right. Shriver Construction, located at the intersection of Pinet and McKinley, as it looked in its heyday and as it looks today. 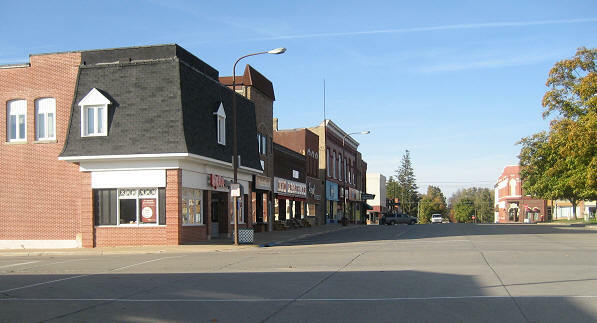 North Wilson in Jefferson, along the west side of the square, looking north. The photo on the left was taken back in 1869, shortly after Jefferson came into existence. None of the buildings remain. 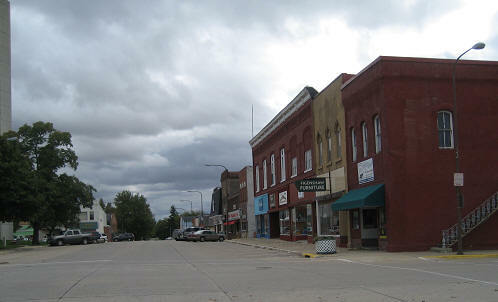 On the right, a similar view as it appears today. 300 East Lincolnway in Jefferson. This address was the site of Conoco for several years, as shown on the left. 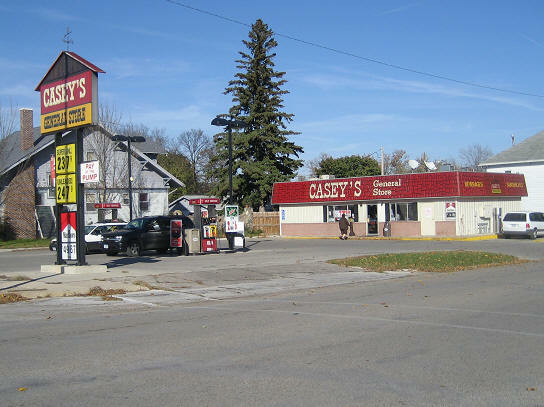 Now, Casey's General Store (one of two Jefferson locations), resides there, and bears little resemblance to its previous business. 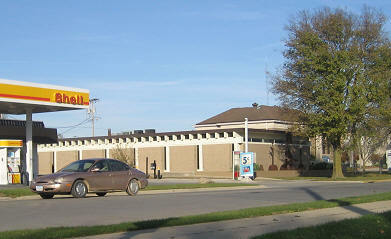 Pauley's Auto Service was located at 220 East Lincolnway. On the left, it is shown as it appeared in 1970. 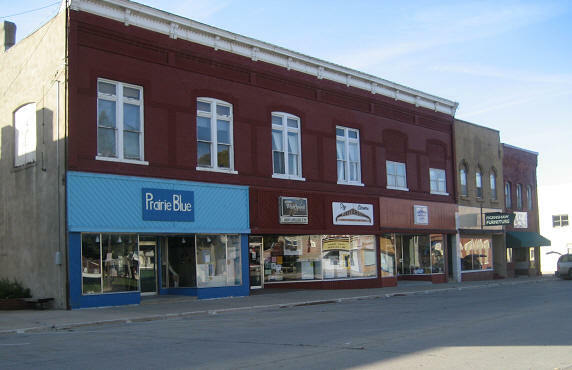 The building is shown from a similar angle as it appears today (right). 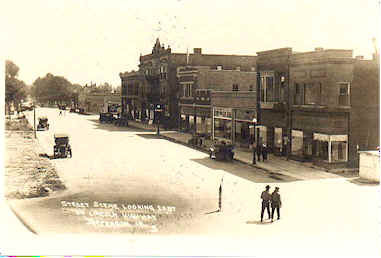 We're looking straight north up Chestnut Street along the east side of the square in both of these photos. The first was taken around 1935. On the right, today's view. 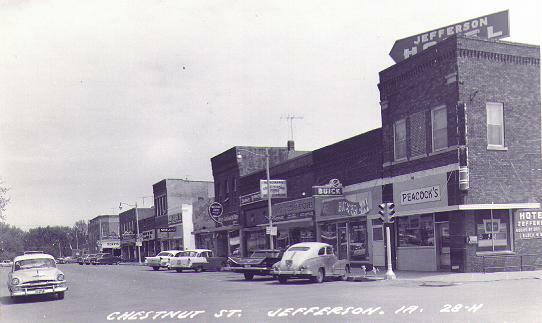 Yet another angle from the square in downtown Jefferson, this time looking at the businesses along North Chestnut Street south to north. On the left-hand side, you can clearly see the theater on the corner. This shot was taken circa 1925. On the right, the same area is seen as it looks now. South Wilson just off the square. The first shot, at left, shows an empty lot. Today (right), the rear of the Peony restaurant is visible just in front of the Mahanay Tower. The vacant lot has been replaced with the now familiar brick structure. 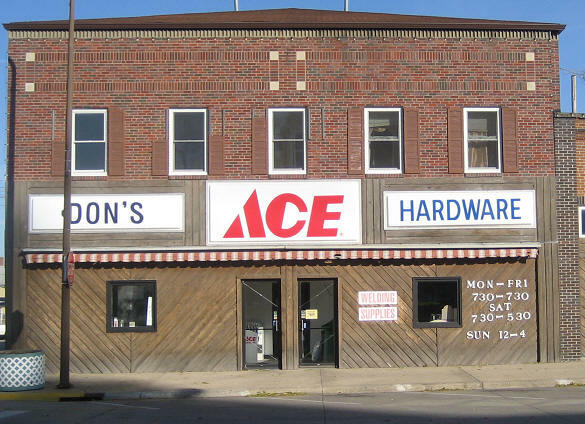 121 North Chestnut in Jefferson has been a hardware store for as long as most can remember. Originally, it was home to the Jefferson Bee. 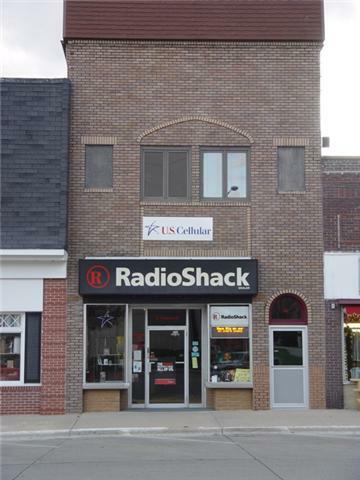 The shot at left was taken shortly after the business expanded to a double storefront. On the right, today's view. 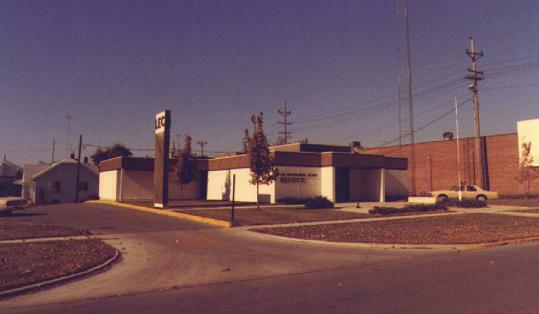 Jefferson's Law Enforcement Center, located at 204 South Chestnut, is pictured on the left as it appeared in 1978. 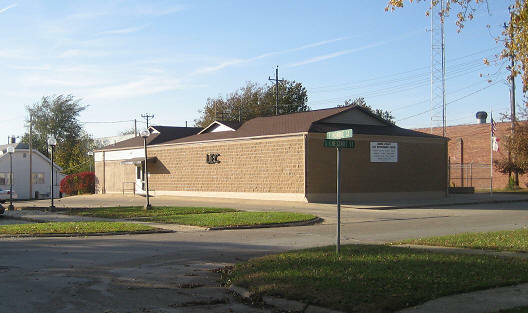 After extensive remodeling and upgrades, the center is shown on the right as it appears today, in the same location. 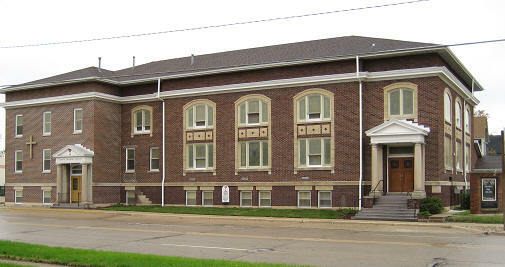 Slininger Funeral Home is located at 119 West Lincolnway in Jefferson. 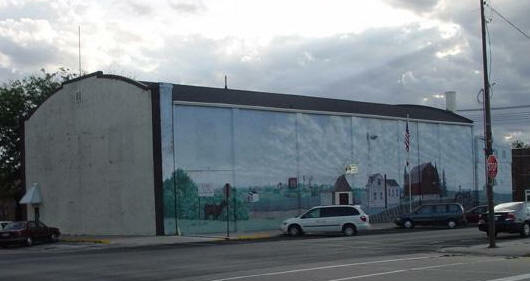 It was originally a one-story structure, pictured at left. Today, on the right, one can see that many additions have been made to the building. 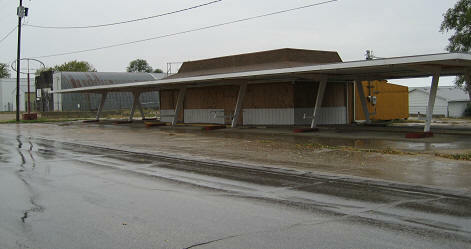 Ferguson-Diehl Lumber was located at 800 East Lincolnway, across from the fairgrounds in Jefferson. 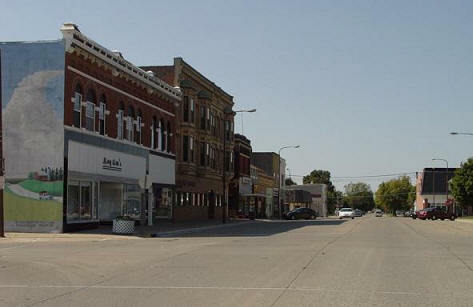 Today, the same location is home to Denison Drywall - pictured at right. 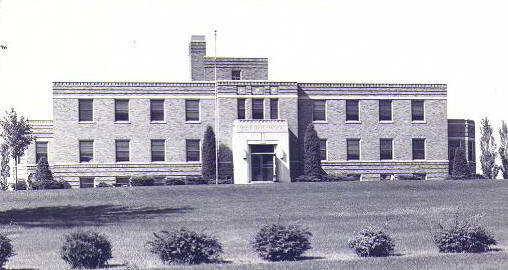 The Greene County Medical Center was built in 1937 on land located at 1000 West Lincolnway in Jefferson. 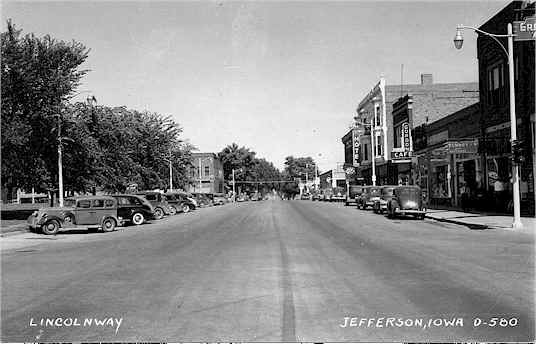 It is shown on the left as it looked in the 1940's. The view on the right is current. 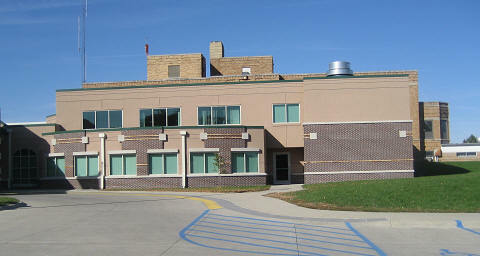 Parts of the original structure are just barely visible above and along the right side of the newer addition. 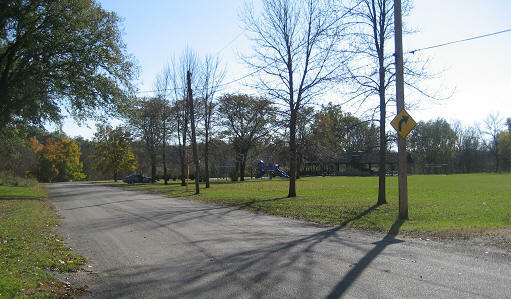 Kelso Park, located on the southwest edge of Jefferson, has long been home to family and class reunions. The shelter house is visible in both views above - the current photo featured at right. Eureka Bridge, located on old highway 30 just west of town, was a major factor in the decision to build the original Lincoln Highway through Jefferson. On the left, it is shown under construction at the time it was initially built. Today (right), it is once again pictured under construction, being upgraded yet again. 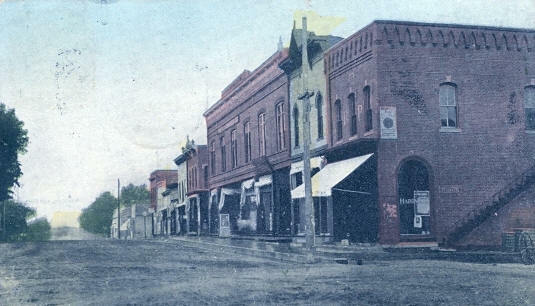 Downes and Mayer Dry Goods was located on the southwest corner of the square shortly after the turn of the century. On the left is a view of the business taken from an old postcard of that era. 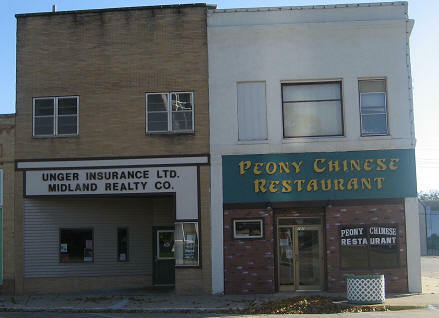 Today, the site is home to Unger Insurance and the Peony Restaurant (right). 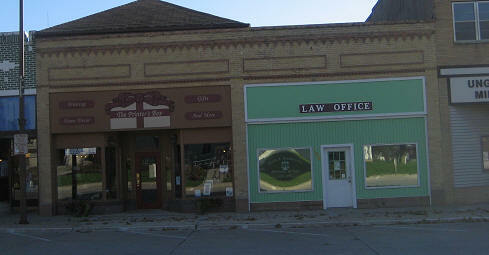 A view of two familiar businesses located on the south side of the square. 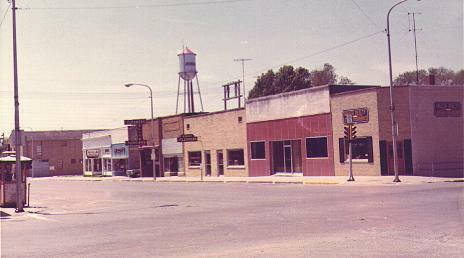 The shot on the left was taken in 1975 and shows Crowley's and the Lunch Box Cafe. Today's view is featured on the right. 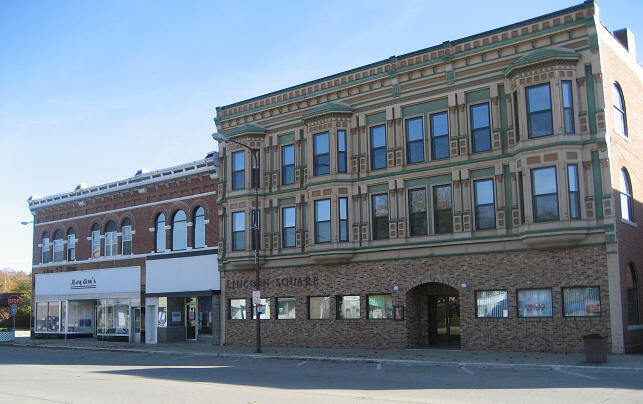 The eastern half of the north side of the square as it appeared in 1975 (left), and again in 2009 (right). 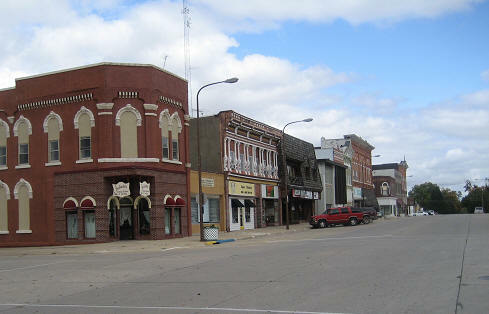 Most of the building facades remain the same, as this section of the square has been comparatively well-kept. 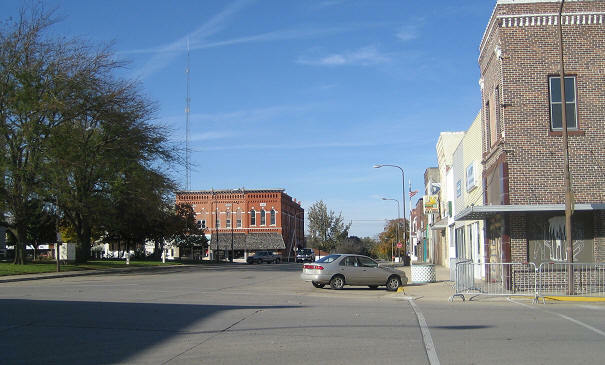 The western half of the north side of the square as it appeared in 1975 (left), and again in 2009 (right). 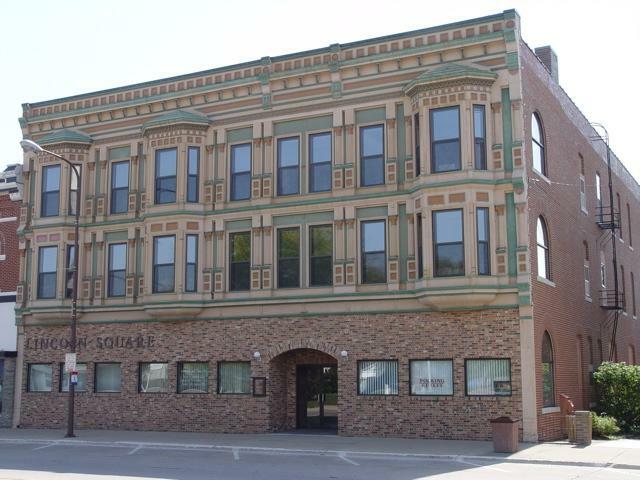 All businesses have changed hands; the Durlam and Durlam building has been divided. 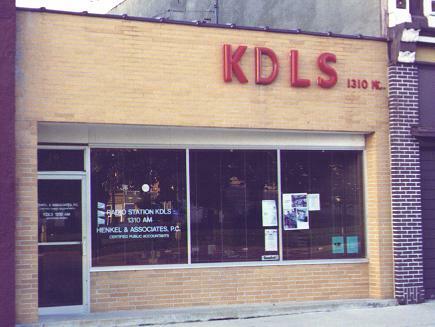 KDLS radio was stationed at 102 East State on the north side of the square. It was photographed for posterity in 1975 (left). 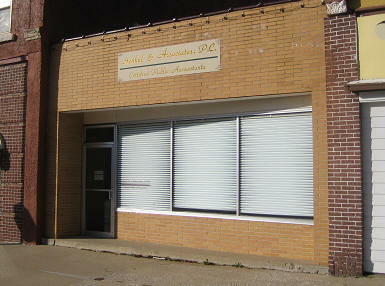 Today (right), Henkel and Associates accounting resides in that spot. 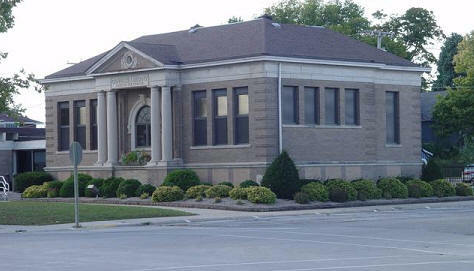 These are photos taken of the public library in downtown Jefferson. In the shot on the left, the adult addition has not yet been built. 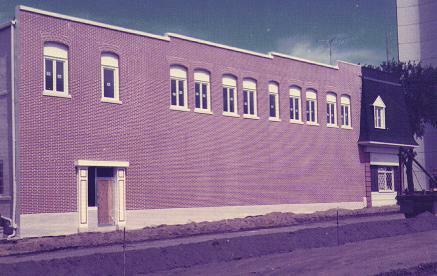 Franklin Manufacturing on East Central Street in Jefferson as it looked in 1970 is shown on the left. The shot on the right was taken in 2009, after the plant had become part of Electrolux. It is scheduled to be closed sometime in 2010. 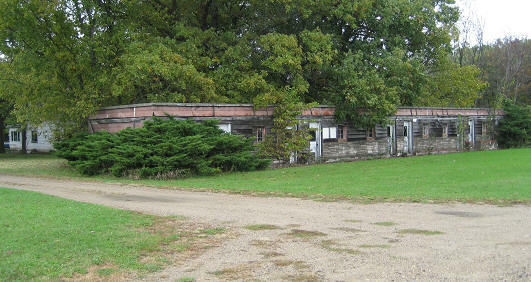 Texaco and the Truck Haven Cafe were located north of town along US Highway 30 for many years. 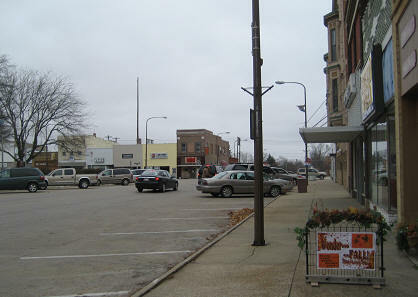 Today (right), that site is the home of Sparky's One Stop convenience store. 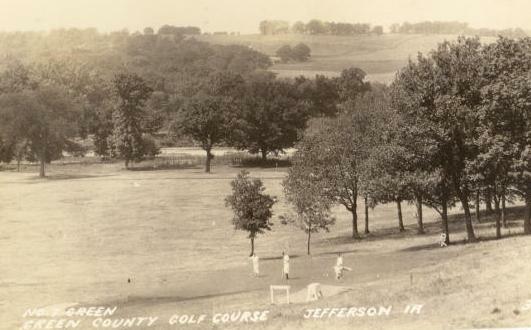 On the left is a photo taken of the first tee box at the Greene County Golf Course in 1937. 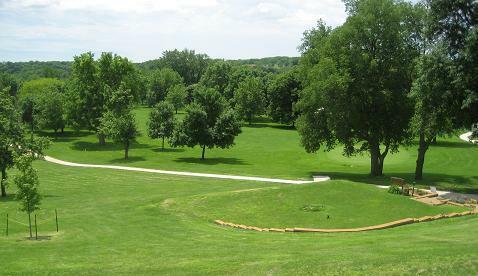 The course later became a part of the Greene County Golf and Country Club, and today is the Raccoon River Valley Golf Course. On the right, the first tee box is shown as it appears today.